Kirk Hopper Fine Art is pleased to welcome back sculptor Mac Whitney. The show opens on November 3 and runs through December 1. Without the assistance of fabricators or assistants, artist Mac Whitney forges steel sheets into beautifully calligraphic monumental statements. Each piece pulsates to the viewer; there is a certain power these pieces yield. "The power from which the distinctive works derive their strength evolves from the artist's personal mechanics and intuitive vocabulary he has gradually built up over the years," says writer Susie Kalil. Ms. Kalil continues, "Whitney's rugged, massive qualities of the material and scale are played off against the ease and grace of their movements." 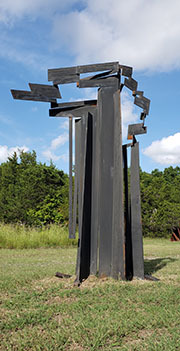 Mac Whitney's work has been collected by a host of museums, including the Dallas Museum of Art. About his own work, Whitney says, "Starting in 1969, most of my career has been spent working in the Dallas Area. I have worked and shown in Berlin, and have shown large-scale sculpture at the Corcoran Gallery in Washington, D.C. I constructed a fifty-foot-tall sculpture for the City of Houston and, over the years, have constructed a number of large-scale sculptures that are in the Dallas area and California. The Dallas Museum of Art has one in its permanent collection.